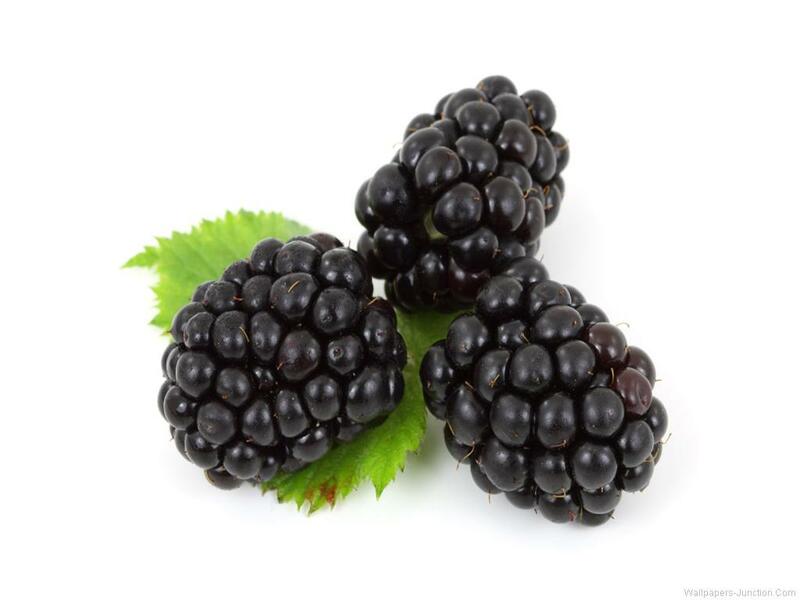 When asked what is a “blackberry”, apparently 82% of people aged 16-24 instantly imagined a mobile phone rather than a fruit, according to a 2013 survey for YouGov. They don’t know what they’re missing! This glorious late summer weather [OK… this was written last week!] means that there’s still time to gather wild blackberries from the hedgerow, the fruit being the one upside of an otherwise aggressive colonising thug of a plant. Blackberries have a long history of being eaten by humans, but a surprisingly short history in cultivation. Read on to find out more of the story behind the one of our favourite soft fruits. 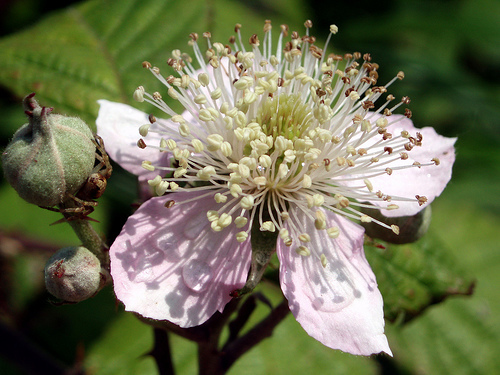 Wild blackberries are relatives of the rose. Like their close relative the raspberry, they are “aggregate fruit” since each berry is really a cluster of tiny fruits, or druplets, each of which contains a seed. There are over 300 wild species in Europe alone, and they hybridize easily, but in Europe most of the deliberately cultivated varieties derive from one of two species. 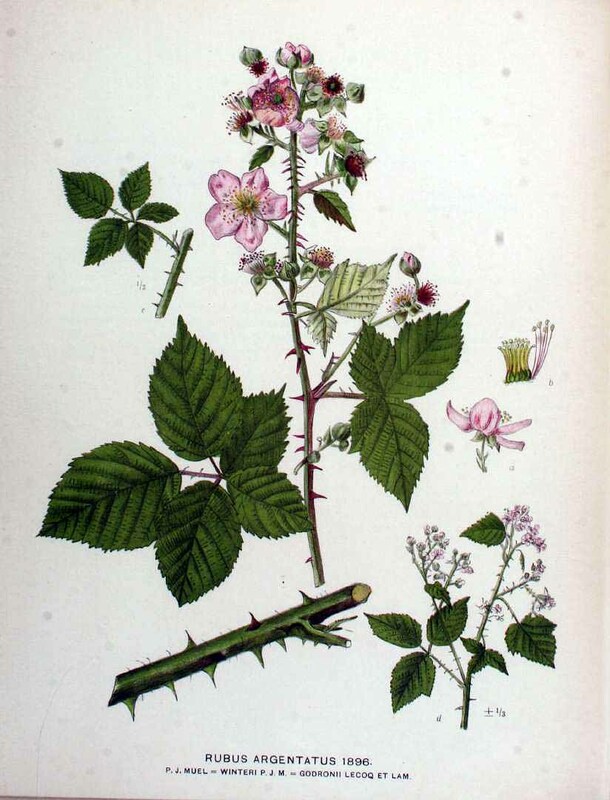 One is Rubus tomentosus which has vigorous upright stems, covered with barbed thorns. It has white or pale pink flowers and round fruit. 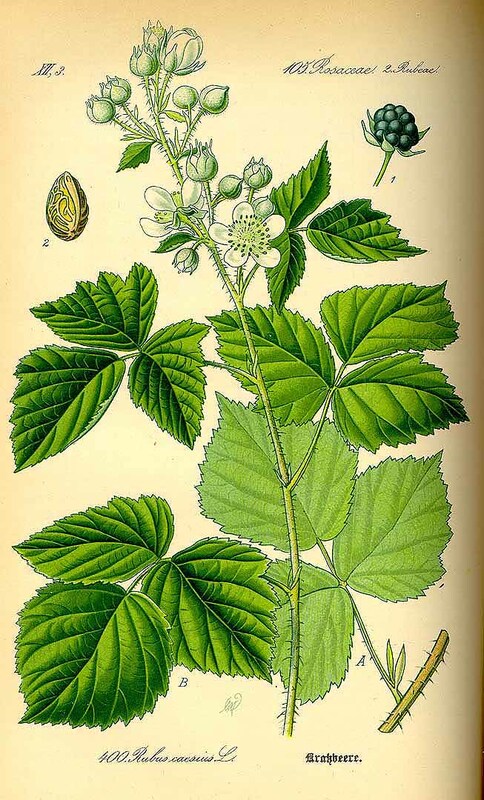 The other is Rubus ulmifolius which has leaves that have a soft felted underside, thorns on the angles of its stems, pink flowers, and egg shaped fruit. Apart from the obvious use of the berries the wild blackberry or bramble had other basic uses. In conjunction with hedgerow trees such as blackthorn and hawthorn They help make an ideal stock-proof barrier. The roots can be used to make an orange dye whilst the stems could be de-thorned, split and twisted to make surprisingly sytrong twine which was often used in broom and basket making. They have a more modern and completely unexpected use today – solving murders! 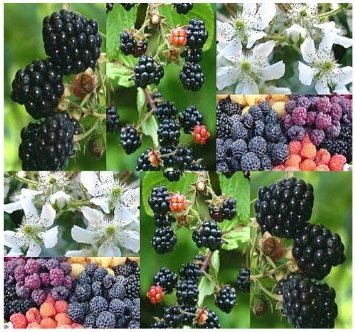 To find out how brambles can help in detecting crime listen to Dr Mark Spencer explain why brambles are a useful tool in his work as forensic scientist. 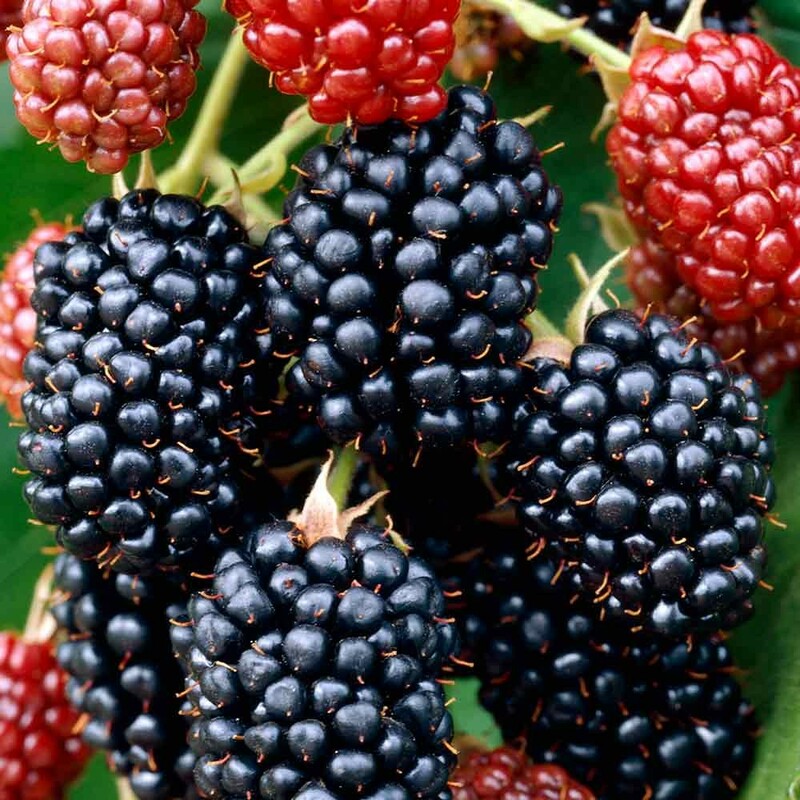 Blackberries get mentioned in Ovid’s Metamorphoses , and a generation or so later Pliny the Elder suggests that their arching habit and their ability to tip-root easily led to gardeners trying layering with other plants. 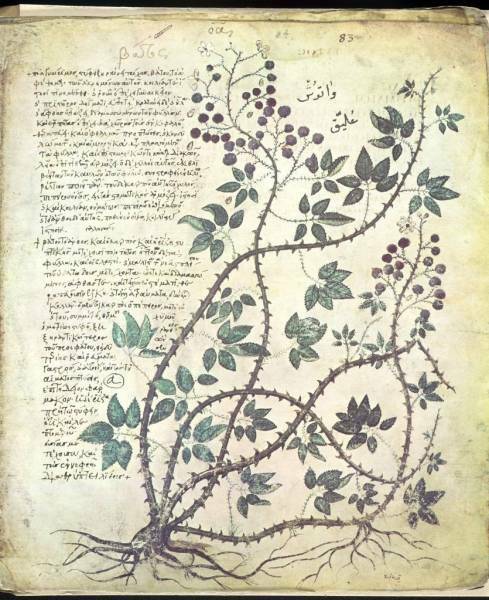 They crop up too in ancient Greek medical texts – such as Dioscorides. But during mediaeval times their association with Satan left them somewhat disreputable, although the fruit and leaves and sometimes even the roots are still often mentioned in herbals and books of physick. But when they did become ‘civilised’ and enter the kitchen garden? 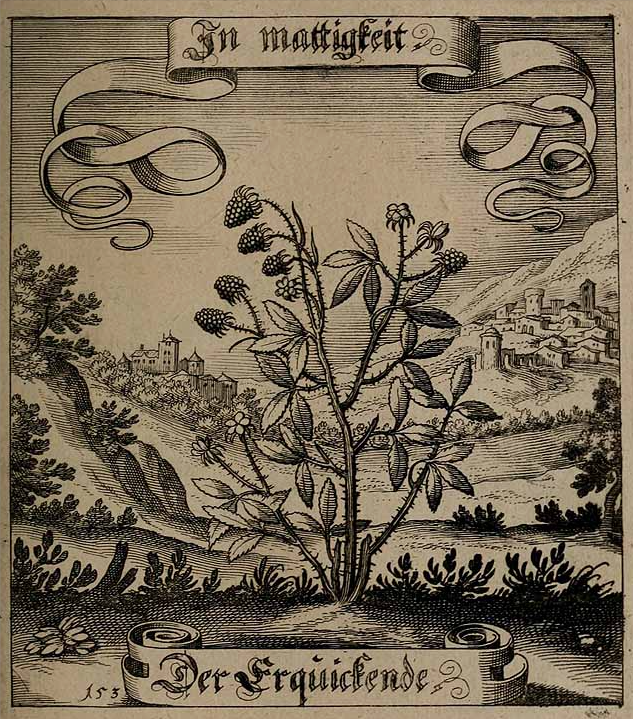 The first reference to garden cultivation I can find is in John Smith’s England’s improvement reviv’d (1670) where he suggests they are grown in a fruit garden in a large bed: “4 pearch in breadth with Rasberry, Blackberry, Barberry, Goosberry and Currant Bushes; All these are to be planted equally in several Beds, and the edges of the said Beds planted with Strawberries.” But despite their appearance in the kitchen garden it is clear they are still being grown for their medicianl value. Smith cites their use on ulcers and “the Sores of the fundament and the Piles”, and also says they were also considered “a powerful Remedy against the poyson of the most venemous Serpents” and for “good for young Turkies, Peacocks, and many other Poultry”. It was Captain Josiah Lovett who seems to have been the first to make an attempt to grow them commercially, in the 1830s although “the plants did not take kindly to the refinements of civilization”. [Bailey, see below] Lovett clearly persevered and is credited with introducing the first named varieties: ‘Dorchester’ and ‘New Rochelle’. 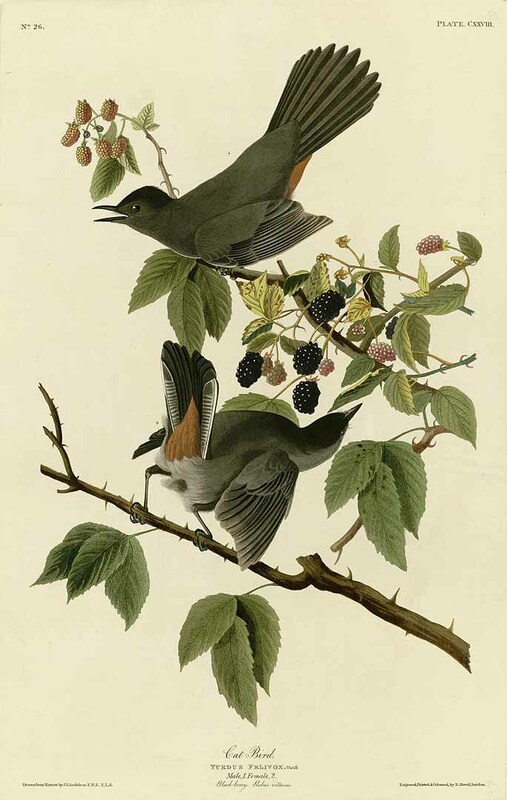 However it is likely that these were merely different strains of native species rather than hybrids and simply “introduced to public notice” from the places after which they had been named. Even so by 1867 Fuller’s Small Fruit Culturist could list 18 sorts worth growing, with others such as the parsley-leaved blackberry noted as ” scarcely worth growing except as a curiosity.” After Lovett other American nurserymen continued the hybridization and so “the blackberry has steadily pushed its way into prominence until today it is one of our most satisfactory and most profitable crops” although “we are far from obtaining perfection.” These varieties then begin to appear on English nurserymen’s lists implying a cross-Atlantic trade. 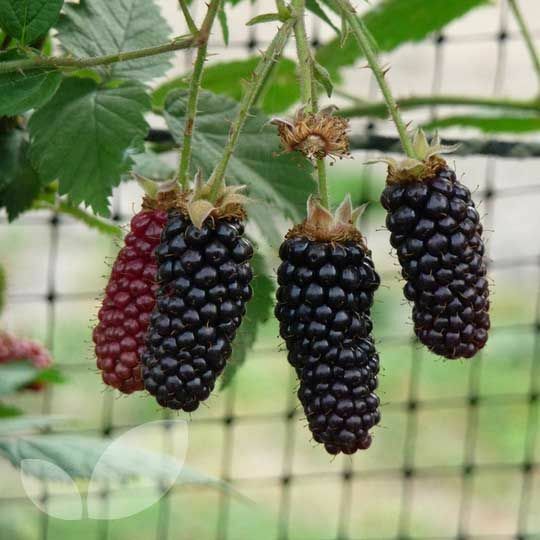 But somewhat surprisingly they are not usually categorized as blackberries but simply as varieties of raspberry, perhaps because several were hybrids between the two. 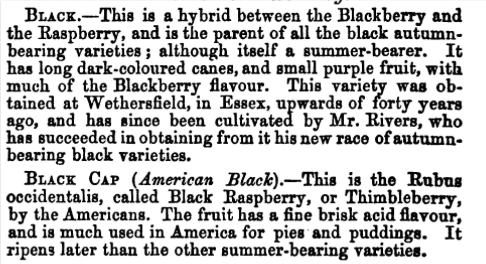 Robert Hogg’s famous Fruit Manual (2nd ed) of 1860 for example lists ‘New Rochelle’ and several other American blackberries as “autumnal bearing raspberries with black fruit”. They were not universally popularly received. 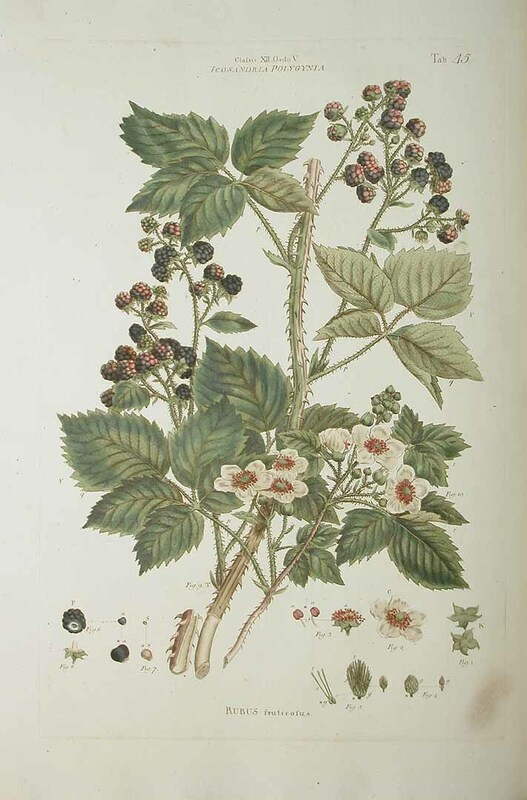 Thomas Rivers, the Hertfordshire nurseryman and fruit grower wrote to The Magazine of Horticulture the same year, 1860, that he had seen “many hundreds of hedges of our native English blackberry giving fruit as large or larger than New Rochelle…” He then embarked on a breeding programme himself, probably the first English nurseryman to do so. Of course these American novelties only impacted on the trendy gardener who had to have the latest import. Cultivated forms, of course, are generally derived by carefully selecting from locally found wild forms, which are then further improved by plant breeding. As such they tend to share characters with the wild forms where they were bred. Nevertheless Most American cultivated varieties derive from just two species. 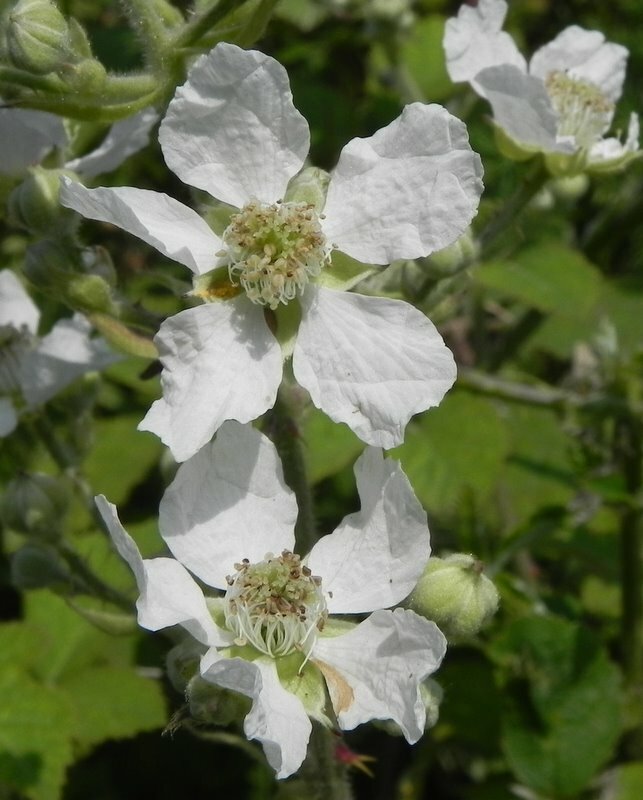 One is Rubus allegheniensis from the eastern mountains has stout, strongly angled canes with large hooked thorns, showy white flowers with sweet fruit. 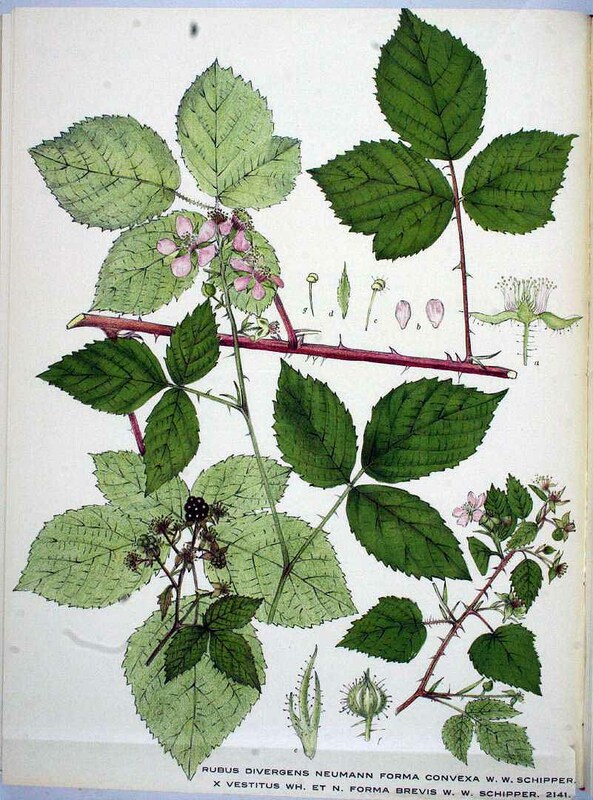 The other is Rubus ursinus or the Californian dewberry has low trailing or climbing stems, armed with tiny, slender, hooked spines, white or pink flowers and long rather than round fruit. 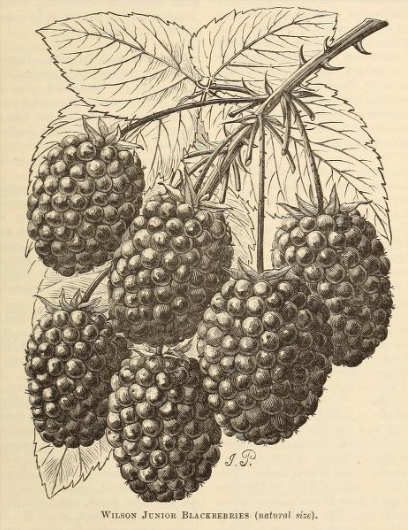 By the late 188os and 1890s gardening books are listing blackberries, although still mainly American imports. 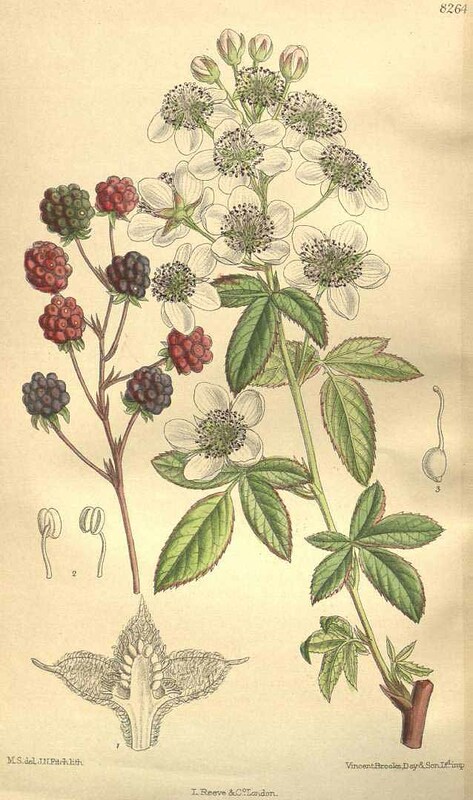 However they were still often confused with, or were hybrid crosses with raspberries. Ten of “best cultivated varieties” are listed in a later edition of Beeton’s Garden Management [undated but c.1886] which goes on to say that the blackberry has sneaked in as ” a new candidate for a prominent place in the fruit garden”. 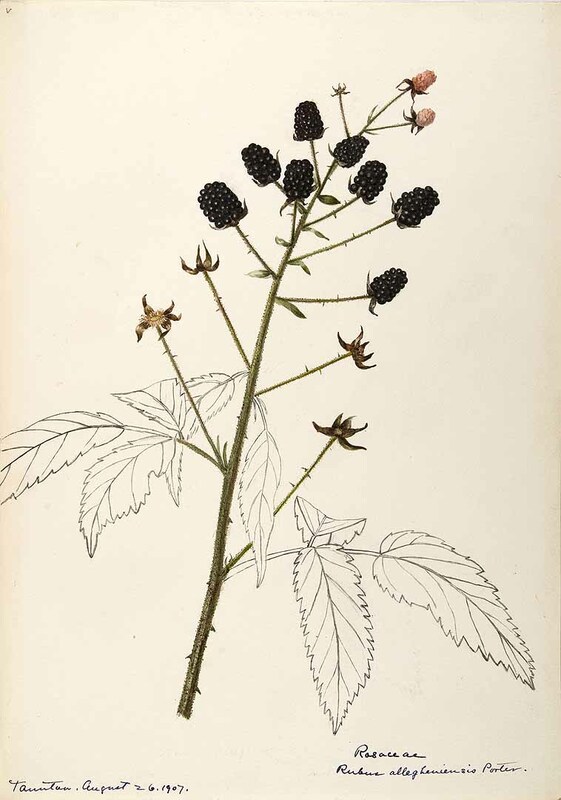 Beeton recommends reading All About Blackberries by Viccars Collyer, a Leicester nurseryman but I have been unable to trace this anywhere so if anyone knows of its whereabouts then please let me know. One has to wonder what ever happened to ‘Wilson’s Junior’ because Thomas Sanders writing in Fruit and its Cultivation in 1919 notes that while such American varieties “were reputed to be worth growing in gardens” and to be “far superior in every way to the wild kinds” they had “signally failed to justify such high expectations.” This was almost certainly simply because of climatic differences. Hybridization continued apace through the 20thc. 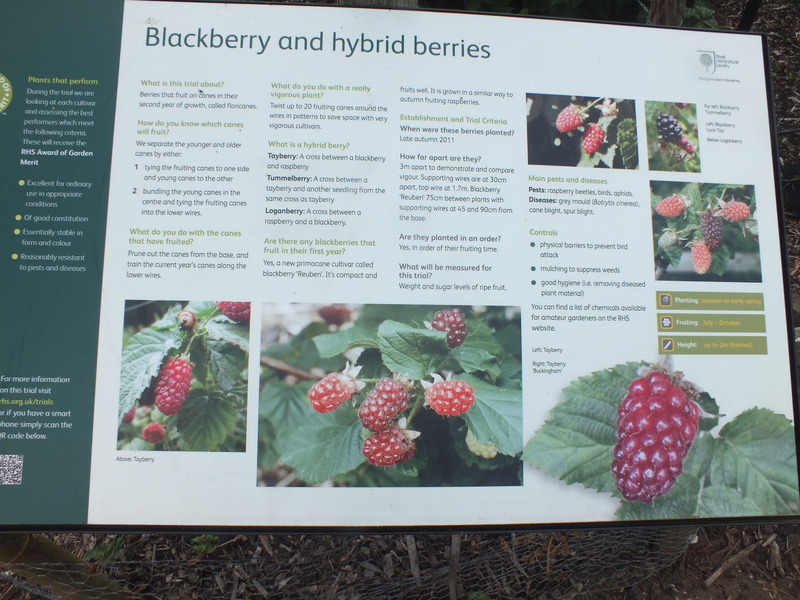 In Britain it was concentrated at the John Innes Institute which used a thorn-free blackberry from southern Europe Rubus rusticanus as a new base for cross-breeding. This eventually led to ‘Merton Thornless’ in 1938. It was however ill-adapted to the climate of eastern America and it took 30 years further developing its resistance to frost, before ‘Smoothstem’ and ‘Thornfree’ the first commercial thorn-free varieties of any importance were bred. The Scottish Crop Research Institute in Dundee has taken the lead more recently developing New hybrids, such as ‘Loch Ness’ introduced in 1988, that can cope with the cooler conditions and much shorter growing season of the north. More recently, the variety which is making a commercial impact is a Brazilian variety, ‘Tupi’ which had very large, flavoursome fruits ideal for the supermarket trade. Growers in much warmer climates such as Mexico have managed to produce two or even three crops a year. 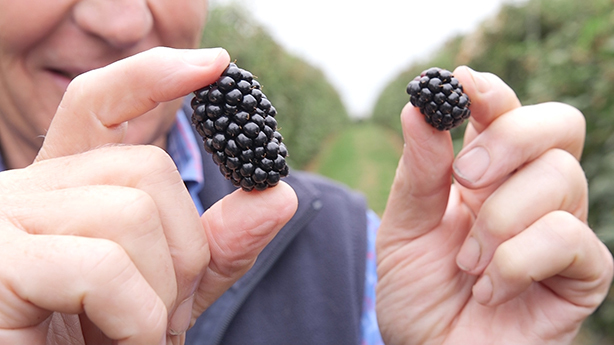 As a result commercial production of blackberries has shifted much further south than might be expected, with Mexico becoming the global leader. But climatic conditions vary so much from region to region that it is unlikely ‘Tupi’ will make much impact on the European market or garden. 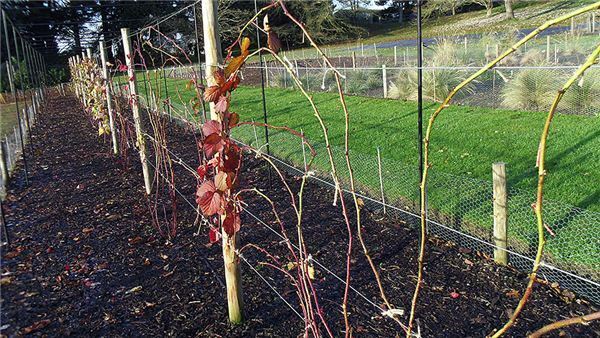 Other major growing regions are the USA and NZ where Wilsons Junior [and many other varieties] were introduced in the 1880s. NZ has a large breeding programme and several popular recent varieties, notably ‘Karaka’, have originated there. 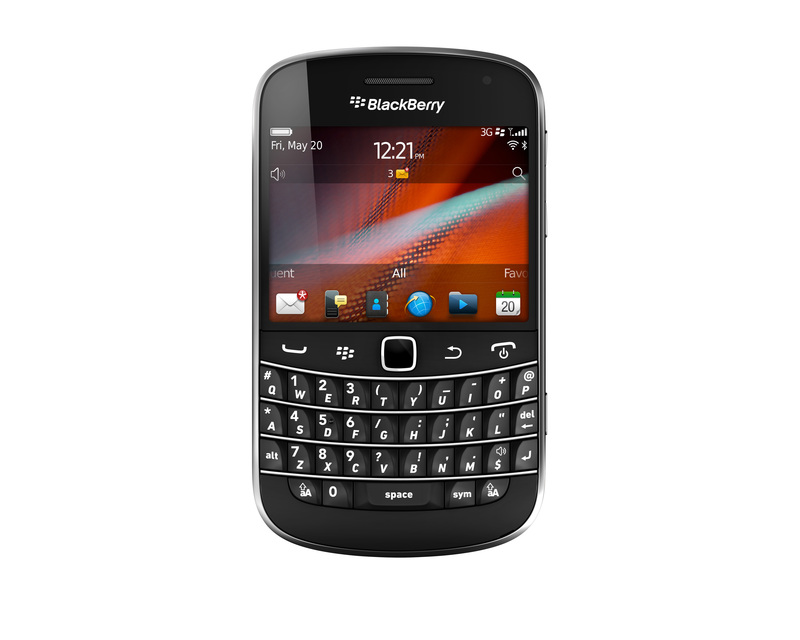 However the blackberry still remain very much a second rank fruit in the European market. 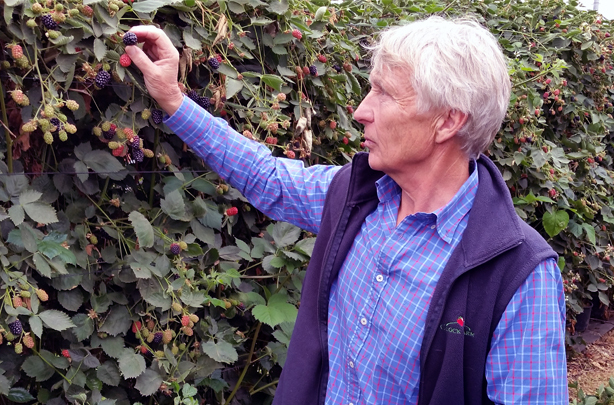 A trial of 19 different blackberries and their hybrids began at Wisley in 2011 to see what varieties will do best in Britain and also to help distinguish between the various hybrids. 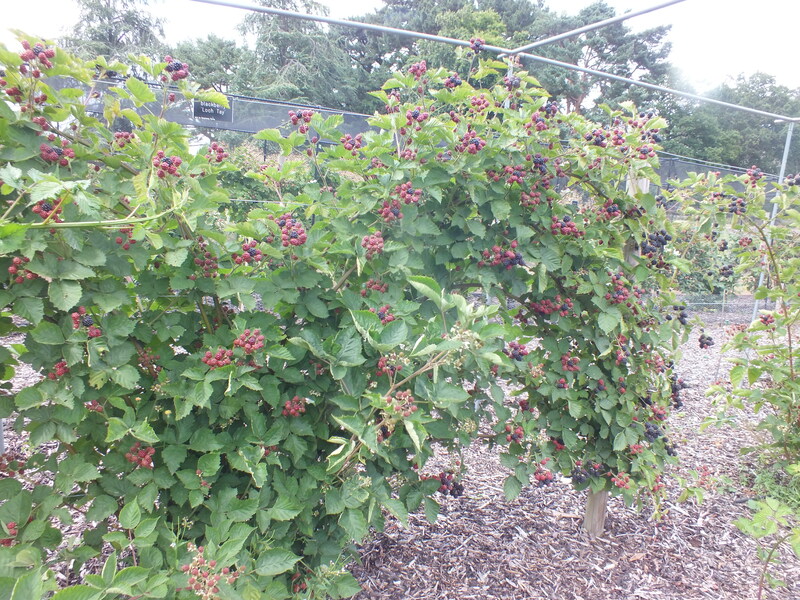 As the RHS blog says “Ever tasted a tummelberry or bitten into a boysenberry – or are you mystified by the whole bunch? Our trial aims to untangle this tasty but complicated group of garden fruits. ” The trial finishes this year and the evaluation and results should be available soon. 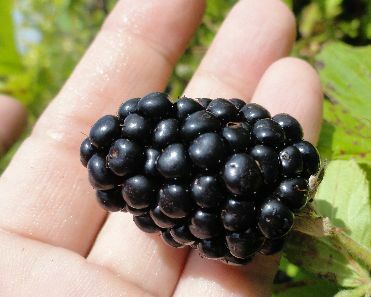 Many of the new varieties have much larger sweeter berries, often on less vicious and rampant bushes. Much of this breeding programme has been driven by the supermarkets. which seem to believe that blackberries could become as popular as strawberries and blueberries. This has led to a drive for much larger sweeter fruit, and one new introduction, ‘Driscoll’s Victoria’ seems to have hit the mark. Not only does it have the essential longer shelf life but it is also unusual as it appears to grow better under protection rather than out in the open, which gives a huge advantage to commercial growers. As a result Tesco have just started selling them in snack packs and claim a huge demand.